Torquay United's longest-serving player Kevin Hill will leave the club and join Dorchester Town. The 32-year-old made a club record 474th appearance as a sub in the FA Trophy final at Wembley last month. But he has found his opportunities limited in the past year, starting just five games and being mainly a sub. The versatile star had been considering a new contract but, with a host of new midfielders signing, his chances would have been further limited. He has agreed to sign a two-year deal with the Blue Square South side on 1 July, but boss Paul Buckle told the club website that he hopes Hill will continue to be involved with the club in some way. "It is an ongoing conversation I am having with Kevin but I would like him to be a part of our Centre of Excellence coaching set-up." "I have thoroughly enjoyed my time at Plainmoor and although I had a couple of chances over the years to move on I always wanted to stay," Hill told Torquay's website. 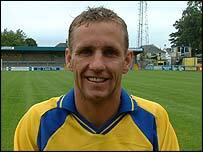 And Hill, who joined Torquay from non-league Torrington Town in 1997, added that he will still support the club and watch their matches with the fans. "This isn't the last you will see of me at Plainmoor, whenever possible I will be enjoying a couple of beers and standing on the Pop Side." Magpies manager Shaun Brooks told his club's official website: "It's a massive coup for this club to sign a player of Kevin Hill's calibre and I believe he will be up there with the best signings the club has made in its recent history."